Roofs, Stairs and Sashes, Cemetery Railings, &c.
All kinds of Iron Work for Building Purposes. Quoting Kevin Walsh's Forgotten New York, "Hammond St. From the Hudson River to Greenwhich Avenue north of Perry Street [now] West 11th Street ... named for Elijah Hammond, who owned a 55-acre estate there formerly belonging to Sir Peter Warren ... Renamed 11th Street in the mid-1800s." A map dated 1857-62 on the New York Public Library's Digital Collections shows a building labeled Hudson River Iron Works at 159 Hammond St. between West St. and Washington St. This location then became 369 W. 11th St. when Hammond was changed to West 11th. City directory listings for Matthias Howell show him at 159 Hammond from 1843 to 1867. In 1868 this address changed to 369 W. 11th. A very similar ad appeared in The New York City Record and Building Trades Directory, 1892, when the business had become M. H. Howell's Sons. Nos. 367 & 369 West 11th St. near West. Every Descripton of Iron Work for Building Purposes. Screw Bolts, Lag-Screws, Nuts and Washers. Matthias H. Howell (ca.1815-ca.1892?) (the name is sometimes given as Matthew H. Howell) seems to have lived his entire life in New Jersey, and to have been the proprietor of the Hudson River Iron Works on Hammond St., then W. 11th St., from the early 1840s until his death (probably no later than 1892). He has left his own name as a foundry mark on the cast-iron facade at 190 Duane St. The coal chute cover on Bethune St. is the only iron I have found in New York with the name of his foundry, and it does not carry his name. The name, Chas. H. Fox, is that of Charles Henry Fox (1870-1934), who became the partner of Matthias Howell's son, Henry M. Howell, around 1898. This partnership lasted approximately from 1898 to 1906. From 1907 to 1924 Charles H. Fox was sole proprietor of the foundry, which remained at 369 W. 11th St. There was a Chas. 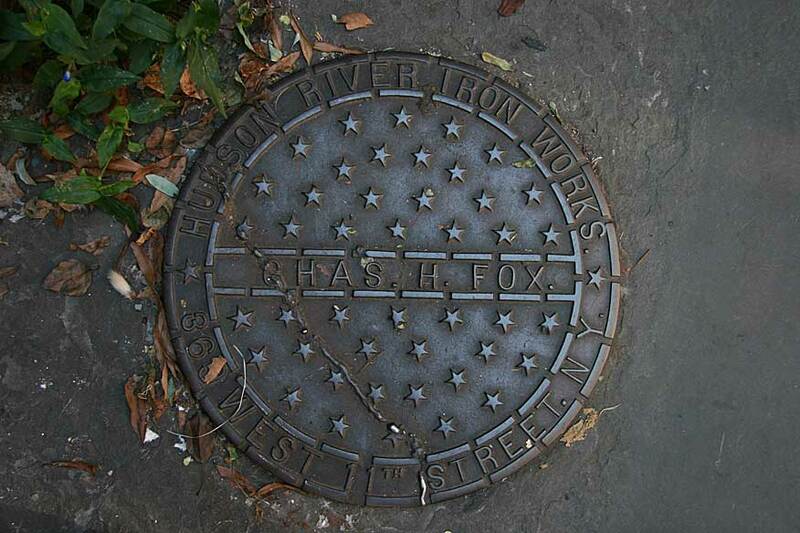 H. Fox Iron Works in Long Island City briefly from around 1927 to 1931. The 1850 U. S. Census (non-population schedules for "Products of Industry," 9th Ward, District No. 1, County of New York) recorded information about M. H. Howell, House Smith. He owned capital of $5,000 and raw material valued at $3800. These materials consisted of 60 tons of bar iron costing $3200 and 10 tons of slate iron costing $600. He employed an average of 10 workers, and paid average monthly wages of $200. The past year's production consisted of 100 sets of iron railings, doors and shutters valued at $8000. In 1856 Joshua K. Ingalls, of Brooklyn, N. Y., secured a patent which was assigned to M. H. Howell of New York, N. Y. This was patent no. 15,113, dated 10 June 1856, for a "Metal Beam." His beam combined cast-iron and wrought-iron sections to lend both compressive and tensil strength to the beam. Assigning the patent to Howell transferred ownership of the patent to Howell. (More about Joshua K. Ingalls can be found on the L. R. Case vault light page.) Matthias H. Howell, himself, secured a patent dated 16 April 1867 for an "Improvement in Soap Frames" (patent no. 63,898). This was a frame used in the manufacture of soap, and Howell's improvement was to make the frame more easily removed from the block of soap, to prevent leaking from the bottom, and to prevent the sides of the frame from bulging during use. Matthias H. Howell was recorded in the U. S. Census in 1880 living on Bergen Ave. in Jersey City, New Jersey. He was 65 years old at that time, and lived with his wife and three sons, Franklin, James and William Howell. All of these sons were connected with the iron foundry at one time or another, but it was primarily a fourth son, Henry M. Howell (1838-1921), who enherited the business from his father. Henry M. Howell was listed as a partner in the business from 1867 to 1906. Charles H. Fox was recorded in the four successive U. S. Census reports from 1900 to 1930. In 1900 he lived at 443 W. 24th St. He was 29 years old, born Oct. 1870 in New York, and he gave his occupation as "Civil Engineer." He used this term for his occupation in the following census reports of 1910 and 1920, but in 1930 apparently the iron business had failed, and he was "General Dry Goods." He lived from 1914 until his death at 542 W. 112th St., Manhattan. He was a member of the General Society of Mechanics and Tradesmen, who put this notice in the New York Times, 6 Nov. 1934, "Sorrowful announcement is made of the death of Brother Charles H. Fox on Nov. 4, 1934, for thirty years a member of the society. He was President of the society in 1918, having served the two previous years as Vice President and Second Vice President... He [served] a total of twenty-nine years of faithful service."